The seventh planet from the Sun is Uranus. William Hershel discovered it in 1781. It is one of the four gas giants in our Solar System, but is much smaller than both Jupiter and Saturn. You will find that Uranus is similar in some ways to Neptune, the eighth planet. Only one Voyager probe has flown by Uranus so very little is known about the planet. 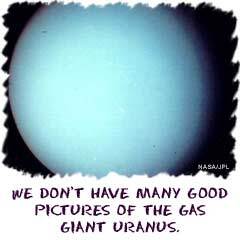 Like other planets we discussed, Uranus is a planet largely composed of gases. It has a light blue color because of the methane in its atmosphere. The atmosphere of hydrogen, helium, and methane is constantly swirling around the planet. As you move from the core to the surface of the atmosphere, you will discover liquid rock, ice, and molecular hydrogen. There is no layer of metallic hydrogen like Jupiter and Saturn. Scientists also discovered something very special about Uranus' axis. Instead of orbiting on an axis like the other planets (up and down), Uranus spins almost on its side. When you see pictures of the Earth rotating, you see it spinning a little off-center. Uranus spins on a horizontal axis, not a vertical one. Astronomers have also determined that Uranus is smooth. There is so much going on in the atmosphere and so little activity in the core that the surface doesn't change. If an asteroid hits the planet, the swirling storms wipe the craters away. Although the storms swirl around the planet, there are few distinct clouds. The atmosphere moves as a constantly mixing soup.